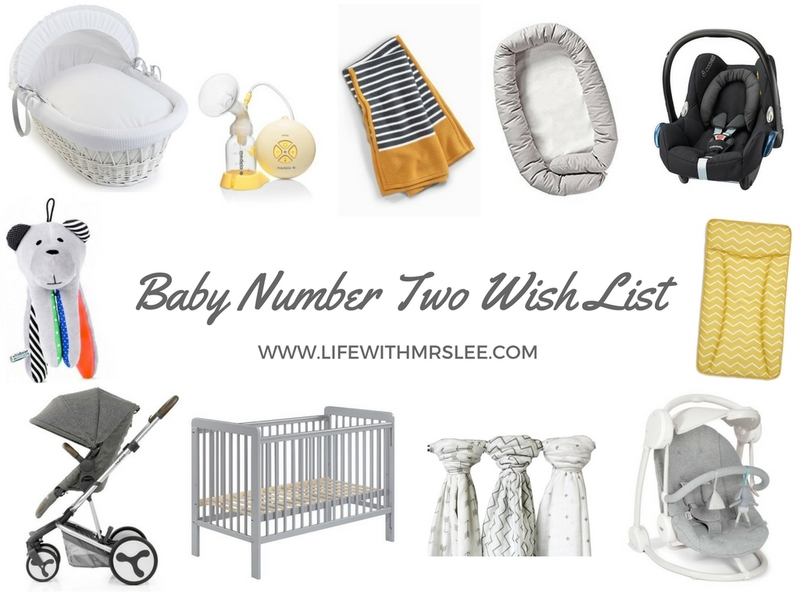 Since finding out we were expecting again I have been slowly compiling a little wish list of things we would like to get for Baby Number Two. Today I am sharing my top picks with you. As you can quite clearly see, I am absolutely LOVING all the greys and yellows for this baby. This wish list is a combination of things we have already purchased ourselves, a couple of products from some amazing brands we are super excited to be working with and there are also a few bits we still hope to get over the next couple of months. We had a lovely looking Moses basket for Bella but she absolutely hated the thing and it was a real struggle to get her to sleep in it. I think the main problem was that it was a bit narrow and she was a bit chunky! This beautiful basket from Izziwotnot seems to a be a bit bigger and wider so hopefully baby boy will be super comfortable in it. We have actually gone for grey wicker and a grey stand and it is GORGEOUS. I breastfed Bella for 11 months and I am hoping to be able to do the same for this baby too. I didn’t really need to express for Bella regularly but there was the odd occasion when it would have been handy if she had taken a bottle. I did use a manual breast pump a few times but with very little success sadly. This time my sister is very kindly lending me her Medela Swing electric pump which she got on really well with so hopefully I will too! When I was expecting Bella the first blanket I bought for her was very similar to this one just pink. She still sleeps with it on her bed now and loves it so of course, I had to get one for baby boy too. There are so many different baby nests on the market now and it is something I wish I had when Bella was small. As I said above, she wasn’t a fan of her moses basket at all. I remember rolling up cellular blankets and popping them around her to try and make her feel more snug and secure!! So a baby nest definitely seems like a much easier option and I have heard such wonderful things about them. This one from BabyDan looks fab and is supposed to last up until six months. It’s also a fraction of the cost compared with some of the other brands! A car seat is of course a must. We had a Maxi Cosi one last time and loved it but we sold it on when Bella moved into her bigger one. We’re basically just repurchasing the same one as we still have the Isofix base for it. The children’s shared bedroom is grey and white with pops of yellow and pink. This bright yellow change mat will be the perfect pop of colour! We had a very floral version of this swing with Bella and it was an absolute lifesaver. Probably one of my favourite baby items we had for her in fact. It sings lullaby’s and has a timer that you can set so it swings for 15 minutes which FYI is the perfect amount of time to grab a quick shower and get yourself dressed! You can never have too many Muslins, they are an essential baby product and can be used for pretty much anything! I plan on getting a few of these larger ones for swadding, to drape over the car seat/pushchair and to use as breastfeeding covers. This time we needed to purchase a smaller cot for baby as we just didn’t have space to use Bella’s old cot bed as it’s quite large. So we have gone for this space saver grey cot from John Lewis which arrived yesterday so Josh will be assembling it at the weekend. This gorgeous pushchair arrived last week and it is probably the thing I am most excited about using when baby arrives. I couldn’t resist setting it all up and I am so impressed with it. It seems really well made and looks like it will be very comfortable for baby too. When Bella was small we used to use a white noise app on our iPad to help settle her which meant leaving it next to her moses basket or in her room for hours on end until the battery went flat normally! I stumbled across Whisbear which sounds like such a genius idea. It initially plays for 40 minutes until your baby is hopefully asleep but it also has a cry sensor so when baby starts to get upset it slowly comes back on for another 20 minutes to soothe baby back to sleep. Amaaaazing. What are your baby must haves? I’d love to know! So exciting thinking about and getting ready for your new arrival. I learnt a lot between no.1 and the arrival of 2 & 3 (together!) what were good investments and what weren’t. I love the colour scheme you have chosen – grey and yellow is lush. I love Maxi Cosi car seats! That pushchair looks great and I love the blanket too! Love the yellow and grey colours! I really enjoyed the baby stuff shopping! Love the changing mat colour! So pretty! I think the humming bear is so cute but how cool that it detects them crying. Great product!